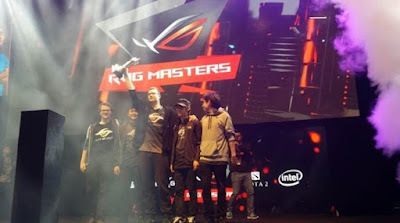 Home Asus Games News Team Secret Wins ASUS ROG Masters DOTA2 Championship; Bags USD150,000 Prize Money! Team Secret Wins ASUS ROG Masters DOTA2 Championship; Bags USD150,000 Prize Money! Team Secret won the first ever ASUS Republic of Gamers Masters DOTA2 Championship by beating Team Excration of the Philippines in a 3-0 sweep. Held at the Kuala Lumpur Convention Center in Malaysia, the winning team from Europe just got $150,000 or Php7 million richer. As a direct invite to the said tournament, which is considered as one of Southeast Asia’s biggest, the champion group is composed of captain Clement “Puppey” Ivanov, Johan “pieliedie” Åström, Pyo “MP” No-a, new addition Maurice “KheZu” Gutmann), and Yeik “MidOne” NaiZheng. Without question, they will be competing once again in Asia for a number of tournaments next year. On the other hand, the Cavite-based Team Execration (XctN) is composed of captain Kimuel “Kim0” Rodis, Khim “Gabbi” Villafuerte, Djardel Jicko “DJ” Mampusti, Abed “Abed” Yusop, and Rafael Sicat “Rapy” Palo. They got entry into the Republic of Gamers Masters World Finals by winning the Southeast Asian game qualifiers. In September 2016, they became champions of the MPGL. That merited them a direct invite into the Boston Major in Massachusetts in December 2016. For the first Major of the 2016-2017 DOTA2 Championship series, Palo will be substituted by Adam Erwann “343” Shah. With the rise of teams such as Excration and Mineski which also fared well in the ROG DOTA2 World Championships, ASUS Philippines pledged its support for the growing e-Sports scene in the Philippines. Aside from supporting e-Sporting events, they will continue to offer the best gaming computers through their Republic of Gamers line.